I’ve now done the stats work for Serie A and can confirm – it is effective. 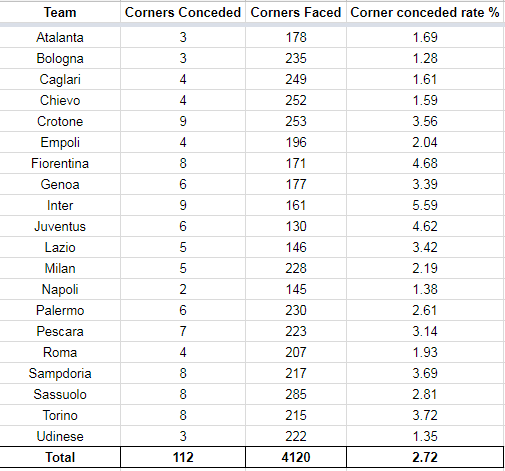 Little did I know it at the time but the Atalanta goal was one of only 2 goals that Napoli conceded from 145 corners faced, giving them an impressive 1.38% corner conceded rate. I’ll analyse their set-up against the 3 teams who scored the most from corners in the Serie A during the last season – Atalanta, Lazio and Udinese to see if the set-up remains a constant and how best to attack it. Here we see Napoli concentrate on zonally guarding the 6-yard box and goalkeeper with a ring of players. The two centre-backs Kalidou Koulibaly (#26) and Nikola Maksimovic (#19) sit centrally at the heart of the defence. Interestingly Arkadiusz Milik (#99) – perhaps due to his height – is also sitting in the centre of the defensive set-up. The trio of Piotr Zielinski (#20), Jorginho (#8) and Jose Callejon (#7) then create another line of players just beyond the 6-yard box to help prevent any runners getting an advantage over those sitting a bit deeper. This sort of zonal marking is, in my opinion, one of the best ways to zonally mark. As if often picked up by pundits, the main weakness of zonal marking is facing runners. As your players are static in their zone, it means anyone running onto the defending player has a huge advantage in winning an aerial ball due to sheer momentum. By having two lines of players marking zonally as Napoli have done above, you’re making that path towards goal harder for the runners to reach, rebalancing the odds. An interesting defensive layout here that focuses on players forming a “U” shape starting on the edge of the six-yard box. Again there’s an emphasis on defending the front post with Marek Hamsik (#17) taking his place from the first corner on the edge of the six-yard box. This shape looks a bit more defensively vulnerable compared to the first corner, with just the one line of players, giving the advantage to the attackers, however, the poor delivery means nothing comes from it. A ring around Pepe Reina provides a good defensive base but with the other players not really man marking and being in the middle of nowhere means it’s another pretty poor defensive set-up. Jorginho (#8), Zielinski (#20) and Callejon (#7) all need to be tighter in front of that ring for this to be a really effective set-up. A much better set-up this time around with Zielinski (#20), Elseid Hysaj (#2) and Jorginho (#8) sitting much tighter in front of the main defensive line, creating that second buffer leaving Atalanta out-manned with no advantage in the corner. A rare goal conceded! As I pointed out above, just the one line of players marking zonally leaves you vulnerable to runners and a flick on finds an Atalanta head leaving Pepe Reina floundering. That being said, I do really like that defensive shape and set-up, but would move Callejon (#7) in front of Maksimovic (#19) and ensure Amadou Diawara (#42) is closer to the main group, giving that essential buffer. This corner led to a further three Atalanta corners (not included in this analysis due to being identical in each teams set-up) and shows the effectiveness of Napoli’s setup when coordinated well. 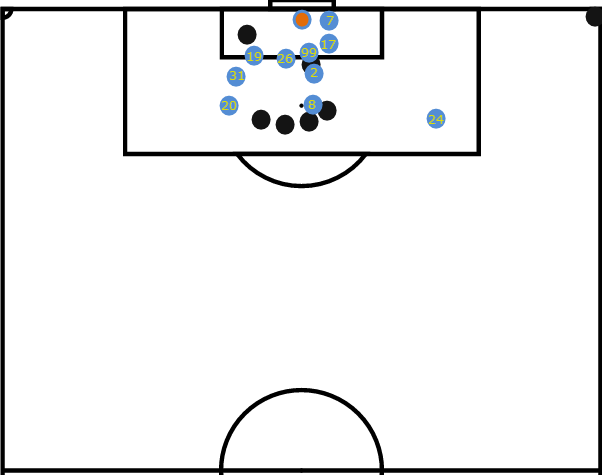 We again see the wall of Napoli players at the near post and on the edge of the six-yard box, with the further wall of players again deployed in front of them for an extra buffer. 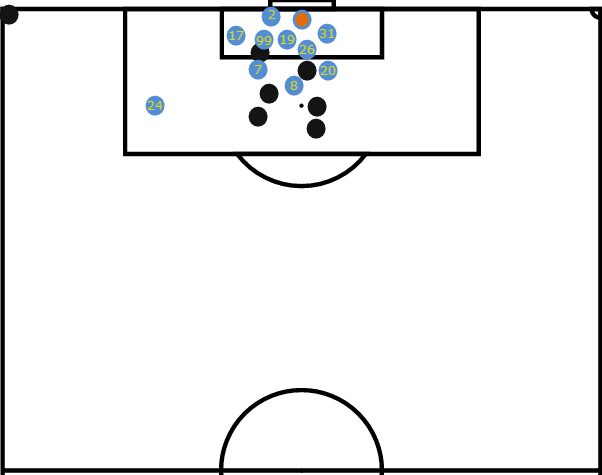 Every corner was dealt with well and Atalanta never properly threatening against this set-up. The buffer was again absent and the onrushing of Atalanta players towards the near post looks to cause the Napoli defence problems. However, the line of players at the front post shows the value of having a group of players in that position as no Atalanta player can get a clean connection on the ball. A slightly better layout, with a little bit of redundancy with a small buffer of players in front of the main defensive line. Almost caught out by the player at the edge of the box managing to get a shot off but luckily the delivery and first touch left a lot to be desired. Again just the one wall buffer alongside the wall at the front post, but luckily for Napoli the ball was hit straight into the wall of players at the near post. Again the “U” shape is deployed and looks to be relatively effective at dealing with incoming corners, with a couple of players forming that important buffer. Looking at the picture I created above it would look as if Lazio would have a great chance of winning the ball if the ball were crossed in, with just a row of 3 players sitting just in front of the 6-yard box with plenty of Lazio players ready to run onto it. Inexplicably though Lazio take the corner short and pass it all the way back to retain possession, wasting a potentially great chance. Almost perfection in the Napoli setup and execution here, the wall of 4 players on the near side of the post stops any runs or flick ons in that danger area, the wall of Vlad Chiriches (#21), Koulibaly (#26) and Faouzi Ghoulam (#31) form the first wall, with Zielinski (#20), Diawara (#42) and Hysaj (#2) creating that buffer that stifles any sort of Lazio run into the danger area as the corner is easily snuffed out. Another fantastic setup that actually leads to a good counter-attacking scenario. Again with the successful buffer system that works so well, although Lazio do manage to get a (low xg) shot away. The double buffer system is again utilised well, with the corner hitting the effective front wall. The double buffer wall in action again, a poor corner but the defensive set-up was good and I think if that scenario was repeated 100 times with the players in the same spots Udinese still wouldn’t have scored. A great setup. 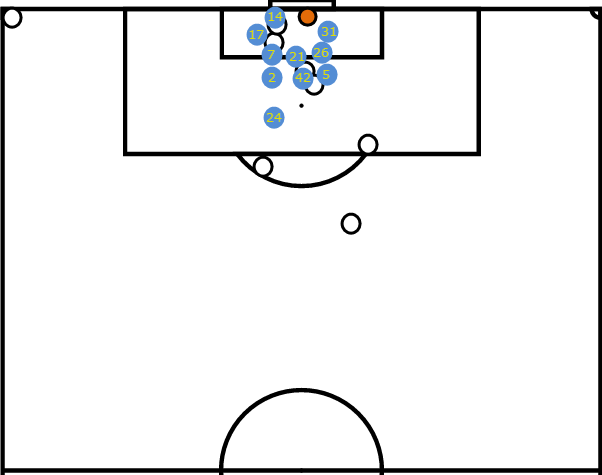 As above, the double buffer system restricts the runs the Udinese players can make, and it’s an easy catch for Reina. Exactly the same as above. The only other goal Napoli conceded from corners and I’d say there’s not a lot that could’ve been done to prevent it, the ball is hit into the usual impenetrable front wall of players yet somehow the Udinese player beats 2 Napoli players to the ball leaving Reina with no chance. Highly unlucky. 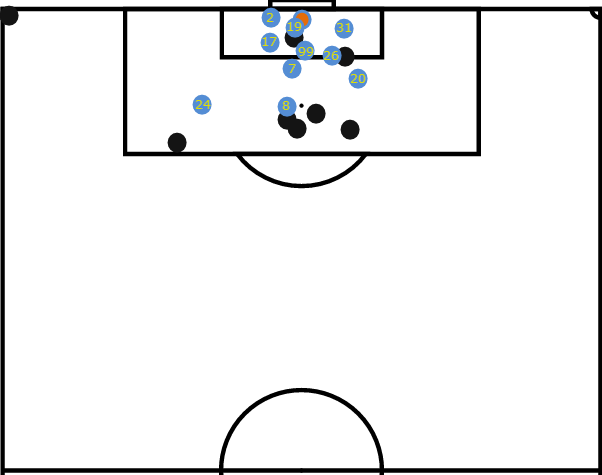 Udinese trying a different approach with an out-swinging corner, but again couldn’t breach the Napoli defence. The double buffer system again used well to stop the Udinese threat – who had a large (6) number of players making attacking runs. It’s obvious looking at the lineups above that Napoli has a clear defensive system in place. Lorenzo Insigne (#24) always hovers ready to close down the short corner, with Hamsik (#17), Mertens (#14) and Callejon (#7) guarding the area nearest to the front post. Whichever duo is playing as CB sit in the middle of the 6-yard box forming a line of 3 along with Callejon, then the remaining four players either forming a “U” shape or 2 walls of players. As stated many times in the article, I definitely think the 2 walls of players is the most defensively sound (also demonstrated by Man City in my last defensive analysis article), especially when combined with the wall of players at the near post. So are there any weaknesses in their setup? Firstly in the “U” setup I’d say the 2 centre-backs are the most vulnerable and could be exploited with a few runners if the delivery is good enough, if we again look at one of the corners in the first Lazio game (seen below) this becomes apparent – if the 4 Lazio players by the penalty spot were to make attacking runs towards the 2 centre-backs they’d definitely have the advantage – however, Lazio wasted the chance by taking a short corner. Attacking the double buffer system is a bit harder to pinpoint a weakness. It’s apparent in the diagrams and videos above that not a lot of emphasis is put on defending the back post so I’d highlight that as a potential option to try to exploit, but successfully delivering the ball in that area is difficult due to both the distance required and the trajectory (it’s more than likely that the goalkeeper could get something on it before an attacking player), however taking the corner short then delivering the ball to the back of the 6 yard box with some runners attacking that space behind the centre-backs would likely end in better success than whipping the ball into Napolis formidable defensive system.